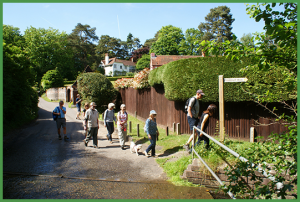 A group of walkers enjoying the sunshine enter Millennium Walk, which passes alongside The Bourne Stream. The Bourne area is fortunate in possessing an extensive network of rights-of-way (ROW), which consists of footpaths, bridleways and byways open to all traffic (BOATS), most of which date back to its rural past. 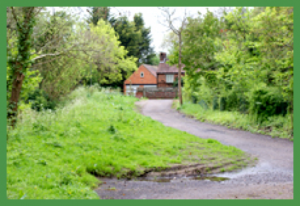 These paths and bridleways offer safe access to the varied countryside throughout The Bourne and are well used by residents, dog walkers and ramblers for healthy recreation. Ecologically the ROW is important in providing green corridors along which wildlife can disperse and are especially important in linking the valley of The Bourne Stream with patches of public open space. Hence, it is important that the ROW network is maintained in excellent condition and, wherever possible, improved. Unfortunately, there are several problems in achieving this. A major issue is the small budget allocated by Surrey County Council (SCC) for ROW maintenance. There is a multiplicity of jurisdictions that have statutory responsibility along the footpaths as well as SCC, Waverley, the Forestry Commission, different Government departments and even owners of adjoining property that may have a degree of responsibility for some aspect of each footpath problem. Additionally, the system for spotting and reporting problems has been haphazard so a new problem may go unnoticed or unreported for long periods. Some years ago, the Bourne Conservation Group launched a voluntary Footpath Warden scheme. The aim of which was to introduce an informal system of volunteer Footpath Wardens to monitor footpaths and bridleways in The Bourne, and thereby enabling any problems to be reported promptly to the SCC Countryside Access Staff for the Waverley area. A common problem is for a path to be blocked by fallen branches. While some of these obstructions can be cleared by our volunteers, larger falls need to be clearer by professionals. Footpath Wardens are all volunteers who have kindly agreed to “keep an eye out” for any problems or areas for correction or improvement on rights of way in The Bourne including overgrowing hedges, blocked gulley’s, broken signage and fly-tipping. 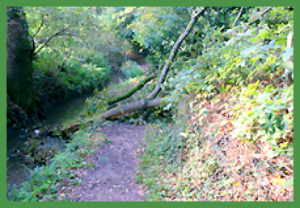 These problems are reported to the Footpath Co-ordinator for appropriate action or, in urgent cases, such as a tree blocking a path, they are reported direct to the SCC Countryside Access staff. are prepared to pick up small items of litter and dispose of them. If an issue on a footpath is urgent e.g. a tree blocking the path or fallen cabling on the pathway, the warden will contact the SCC Countryside Access staff directly, copying in the Footpath Co-ordinator for our records. All other issues are reported to the Footpath Co-ordinator, who assesses the priority of the issue and decides on feasible courses of action, which may include either reporting them to the SCC Countryside Access staff, or by speaking with the BCG committee to organise a work session. A typical finger post marking a junction along Sturt Walk, named for our local historian and writer. The Bourne Valley has many scenic as well as useful footpaths, all of which are well-marked with wooden finger posts at both ends and marker posts at junction points where needed. Several of the footpaths are named to commemorate local people. For example, Stan Cocketts Path commemorates the founder of BCG founder and Minnie Hacks Path is named after a local resident. These names are cut into the signs on the finger posts, as is “Millennium Walk” which follows along the Bourne Stream and was named to commemorate the new century. Any of these signs that become damaged by decay or unfortunately by occasional vandalism need to be repaired or replaced. 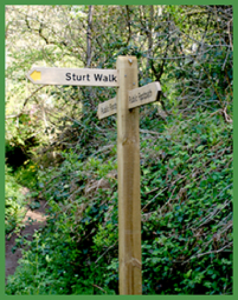 A list of the posts needing such work is maintained with the help of the Volunteer Footpath Wardens and periodically a BCG working group is assembled to undertake the work under the supervision of the SCC Countryside Access Staff. Apparently slow-growing trees and scrub, like holly and laurel can make inroads into the footpath spaces remarkably quickly. Similarly, undergrowth plants like bramble, during summer and autumn quickly invade the pathways making them ‘painful’ to walk along and eventually impassable, so needed to be trimmed back regularly. Every year, two or three BCG working groups are devoted to clearing the worst affected footpaths, but with over ten miles of footpath to maintain there is much to do. So, between times, our Footpath Wardens, as well as BCG members in general, are encouraged to carry pruners with them to trim any stray branches when they are out walking. Up several of our steeper paths we have built new steps to make the walking both easier and safer. These steps were put in up Footpath 43 that leads up from the Stream to Middle Bourne Lane. There are several steep paths leading down from the higher parts of the Bourne Valley to the lower, including those leading down to the Bourne Stream. Some of these have had steps laid over the years, which make walking easier. Periodically these steps have to be renovated – accumulations of autumn leaves need to be removed along with sand that has been washed down the paths during heavy rainfall. 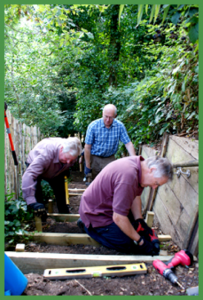 The BCG team helping with the major task of building the steps in Sable wood in 2017 – a hard but rewarding task. In places this soil erosion becomes so severe that that existing steps have to be re-built. In other places, new steps need to be built where none existed before. This happened recently in Sable Wood, the nature conservation area just off the Old Frensham Lane adjacent to the Bourne Woods. Walkers had complained to Bruce Callander, the owner, about the dangerous condition of one path in particular. As a result of erosion the path had become really hazardous. Bruce requested the help of BCG to build some new steps. The erosion from many years of rainfall running, had been exacerbated by the path’s heavy usage by dog walkers, but recently, more seriously, by mountain bikers enjoying the adrenalin rush of racing down the path. It was one of our more challenging projects. 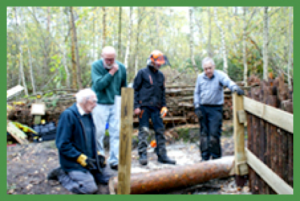 It took three days for our team of BCG members to help Bruce and his friends to emplace large logs – felled by Bruce – into position forming a flight of 14 steps. Each log needed to be securely fixed in position, and the step created infilled. The side tracks were fenced off to ensure walkers keep to the main path, and a gulley dug off the main bridleway to divert rainwater away from cascading down the footpath. The steps were finally finished off with a layer of scalpings provided by Surrey County Council and delivered by a team from Surrey Choices, a volunteer group of young people with learning difficulties who undertake outdoor work for SCC. This was one of the more challenging jobs BCG has been asked to undertake – as the photograph confirms. However, it gave us a real sense of achievement in providing what should be a long-term solution to a problem that was fast becoming potentially serious. Keeping Sturt Walk and the rest of our wonderful network in good order, BCG needs your help. Our footpath wardens regularly walk the paths in their area. However, we still have some paths around The Bourne area that do not have a footpath warden to look after them. If you are a Bourne resident or live near the Bourne and you are interested in volunteering to be a Footpath Warden, please contact the BCG Footpath Co-ordinator. But any help is appreciated, whether it is a simple phone call or email to the Footpath Co-ordinator to report a footpath problem you come across, or by regularly carrying a pair of pruners with you whenever you walk a path and cut back any invasive small branches that are starting to obstruct the path. Preferably, why not join our group and participate in some of our work sessions.